During March there was one change in the credit card offers tracked by this survey, resulting in an eight basis point increase in the average rate for consumer non-rewards credit cards. Despite that increase, the average for this category is lower than it was when the year began, while all the other categories are unchanged so far in 2015. Although credit card rates have been fairly stable, interest rates were very much in the news during March because of growing speculation about when the Federal Reserve will raise interest rates. In its March 18 statement, the Fed's Open Market Committee took the unusual step of specifying that it was unlikely to raise rates in its April meeting, which naturally raises the question of whether the next meeting after that will bring the first rise in the Fed funds rate since 2006. Even when a rise in the Fed funds rate finally comes, it may not have a direct impact on credit card rates because credit card companies have built up a sizable cushion between the rates they charge and the Fed funds rate. This was accomplished simply by not reducing credit card rates in line with the drop in many other interest rates over the past few years. As a matter of fact, according to the Federal Reserve, the average rate charged on credit card balances is pretty much the same now as it was back in mid-2008, just before the Fed started aggressively lowering interest rates. Two things likely to be more prominent than the Fed on the radar screens of credit card companies are credit risk and inflation. Though still lower than the all-time peak reached just prior to the start of the last recession, credit card debt has been climbing steadily over the past three years. The widening spread between rates for customers with excellent credit and average rates suggests that credit card companies are not entirely comfortable with some of the risks they are taking on. The higher credit card debt rises, the higher credit card rates could go -- especially for consumers with flawed credit histories. Meanwhile, now that the price of oil seems to have stopped falling, inflation should move back into positive territory and possibly start applying upward pressure to credit card rates. In short, the months ahead may not be as quiet as the first quarter of the year. The increase in the non-rewards category pushed the overall average rate for consumer credit cards up by three basis points to 17.16 percent, and decreased the spread between rewards and non-rewards rates to 2.37 percent. There were no changes in student credit card offers. 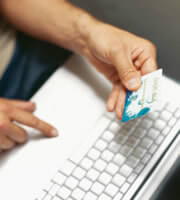 There were no changes in business credit cards during this period. Consumer non-rewards credit card rates rose because one of the credit card offers tracked by this survey increased the upper end of its range of rates. This affects customers with weaker credit histories, and raised the difference between rates for customers with excellent credit and the overall average by three basis points to 4.09 percent. Although that spread did contract a bit in the last survey, the fact that the direction reversed and that the spread overall has been widening over the past year now seems to suggest that the prior month's contraction was an exception rather than a new trend. 0 Responses to "Credit card rate increase may reflect concern about debt levels"